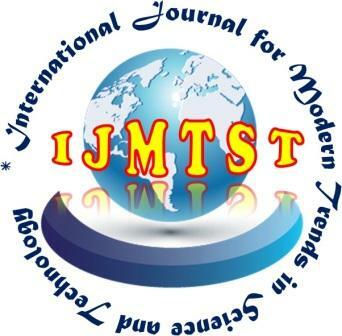 International Journal for Modern Trends in Science and Technology (IJMTST) (ISSN:2455-3778) is an international peer reviewed, online journal Published monthly by Engineering and Science Research Publication. IJMTST represents the new standard in scholarly Publishing: a liberal open access policy, fast and high quality peer review that brings Publishing to the doorstep of every research and student. IJMTST would take much care in making your research paper published without much delay with your kind cooperation. Our journal aims to bring out the research talent and the works done by scientists, academia, engineers, practitioners, scholars, post graduate students of Engineering and Science. This journal aims to undertaking and promoting the scientific research in a broader sense. This journal welcomes the submission of your research papers that meet the general criteria of significance and scientific excellence in the field of Engineering, Science and Technology. IJMTST has a primary aim to publish research being conducted and carried out in the field of Engineering, Science and Technology as a whole. Submitted articles will be reviewed by technical committee members of the journal. All submitted papers should report original, previously unpublished and will be peer reviewed.